There’s nothing better for kids than exploring and playing in the outdoors, but sometimes structured activities and “screen time” crowd out time for free play outdoors. Our events are designed to connect children and adults with nature, but here are some ideas for activities you can do on your own. Imagine you are a bird or a groundhog. Where would you live? 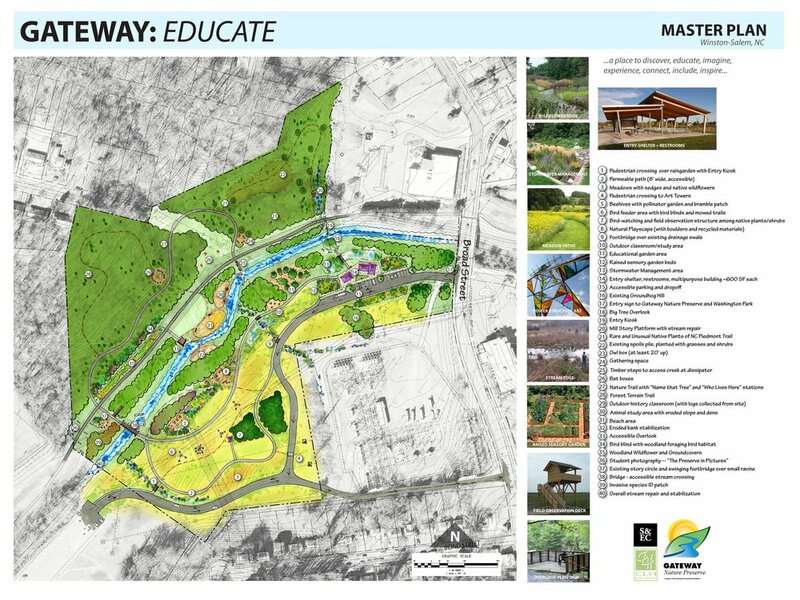 The Gateway Nature Preserve Master Plan, completed in September 2017 by CLH design of Cary, NC, specifies features that will engage children in nature activities and enjoy the features of the preserve. Planned features include a pollinator garden, adventure trails, natural playscapes, and educational programs. We are also working with the City of Winston-Salem on implementing some infrastructure features, including a new entrance road to the Preserve and Washington Park, and a bridge connecting the forest and meadow areas of the site. The Gateway Nature Preserve is located next to Washington Park, south of downtown Winston-Salem. Salem Creek runs through it, separating a forested area on the north side (with Salem Creek Greenway) from an open floodplain to the south, between the Washington Park parking lot and Broad Street.